From the start of the sixteenth century until 1786, the Pont Notre-Dame in Paris was topped by two rows of houses. They were built to a standard design and marked out a paved and very busy street, lined with shops that were home to some sixty or so dealers, most of whom were linked to the trade in art and luxury goods. As the most imposing inhabited bridge in the history of Paris, it was also a major urban-planning feature, linking the Île de la Cité to the right bank of the Seine, as well as a site of intense economic activity. At certain points in its history, it brought picture dealers together on a scale unprecedented in Europe. Pre-eminent among them in the first half of the eighteenth century was Edme-François Gersaint, for whom, in 1720, Antoine Watteau painted his celebrated Enseigne de Gersaint (Fig. 1). Fig. 1. Jean-Antoine Watteau, L’Enseigne de Gersaint, 1720. Oil on canvas, 163 x 306 cm. Charlottenburg Palace, Berlin. Image source: Wikimedia Commons. Since the early 2000s, the Pont Notre-Dame and its occupants have been the subject of a significant upsurge in historiographical interest, enabling a considerable advance in knowledge and a reassessment of their role in art market history. Nevertheless, this singular architectural ensemble, so unlike what it is today (Fig. 2), remains difficult to understand using the traditional methods of art history. The spatiotemperal data about the dealers on the bridge covers nearly three centuries and a dense urban fabric. Sources regarding the morphology of the bridge and its houses are few in number, unreliable, and incomplete. As for the Enseigne de Gersaint, several crucial points relating to its visibility, its function, and its meaning remain merely assumptions or approximations. Fig. 2. The Pont Notre-Dame, Paris, 2006. Photo: Patrick Giraud, Wikimedia Commons. In a bid to further the microhistorical analysis of this socioprofessional milieu and its urban environment and working with a multidisciplinary team, I came up with a research program based on input from digital technology. The contents of this article are based on the results of that collective work. Firstly, a spatiotemporal visualization application, linked to a relational database, was developed to document the location of the picture dealers on the bridge, including any changes over two centuries. 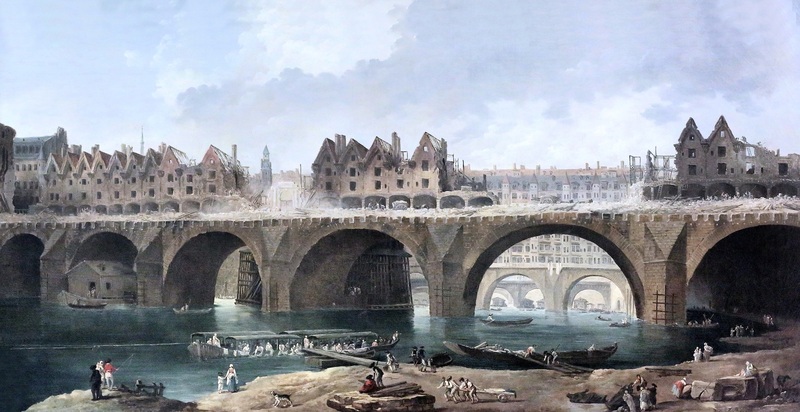 Secondly, the bridge as it was in 1720 was modeled in 3D images in order to recreate a sense of the spaces, materials, and volumes of this vanished architecture. The date was selected because it was during the Regency that the number of picture dealers on the bridge reached its peak. This was also the very year that Watteau painted his famous Enseigne de Gersaint. Lastly, the level of focus shifted to the much narrower scale of Gersaint’s shop, with the intention of recreating the shopfront that accommodated Watteau’s painting so that it could be visualized in three dimensions. Situated on the ancient cardo crossing Paris from north to south, the Pont Notre-Dame was the capital’s first bridge to be built of stone, between 1500 and 1507. Attributed to Italian architect Giovanni Giocondo, it replaced a wooden bridge that collapsed in October 1499. Two rows of houses, built between 1507 and 1512, created a proper street when they were added to the bridge, which was nearly 120 meters long (Fig. 3). Originally sixty-eight in number, the houses were all alike. Tall and narrow, they were each 3.9 meters wide and their facades onto the street were 13.3 meters high. They were owned by the city of Paris and rented to artisans and dealers who sold and exhibited their wares in the first-floor shops, most of them working in the art and luxury goods trade. In addition to mirror makers, clockmakers, feather workers, wigmakers, jewelers, goldsmiths, gilders, merciers, sculptors, and restorers, many of them were painters and dealers in paintings. Fig. 3. The so-called “Turgot” map (after Louis Brétez), c. 1736-1739 (detail with annotation). Engraving. Image source: Wikimedia Commons, detail taken by Sophie Raux. Recent studies by Mickaël Szanto have enabled a reassessment of the Pont Notre-Dame’s importance in the economy of the Paris art market. Previously, a bias prevailed that was based on the negative opinion of men of letters, of whom Diderot was the most outspoken: the dealers on the bridge personified painting brought into disrepute. They were said to trade in poor quality works, exploiting mediocre painters to churn out copies aimed at an ill-informed public. The ideological slant of this discourse conveyed the contempt in which the Académie Royale de Peinture et de Sculpture (hereafter the Academy), the home of noble and liberal art, held the vulgarity of trade. The latter was the domain of its rival, the Guild, whose master painters concentrated for the most part on the Pont Notre-Dame. A look at the economic literature of the day gives a far more positive image of the bridge, seen as a dynamic and well-organized market space, a major exporter of images, and an active distributor of contemporary painting. Moreover, in researching developments in the establishment of picture dealers over nearly three centuries, Szanto found significant variations and stressed the Regency as a key period. For the seventeenth and eighteenth centuries, his research was honed by looking at lease contracts, named and serial sources that also recorded tenants’ business activities. Fig. 4. 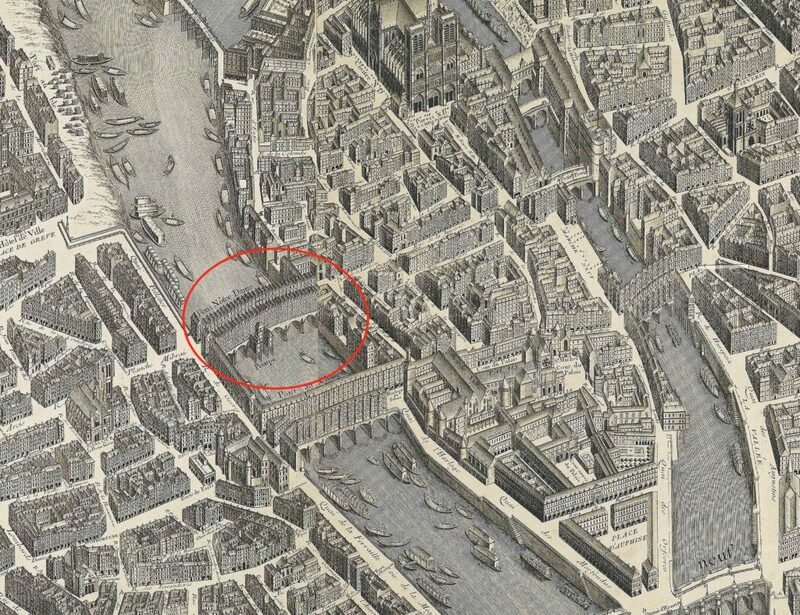 Location of picture dealers on the Pont Notre-Dame in 1631 and Pierre Le Sage’s site. Image made by Christophe Renaud and Sophie Raux using the Art Markets Database, 2017. Fig. 5. Location of picture dealers on the Pont Notre-Dame in 1720 and Gersaint’s site. Image made by Christophe Renaud and Sophie Raux using the Art Markets Database, 2017. To acquire a better understanding of the results of this spatial and longitudinal approach, we developed an application providing a simplified graphic representation of the plots of land on the bridge, making it possible to observe the succession of picture dealers in the seventeenth and eighteenth centuries. Activating a timeline enabled the location of the picture dealers, their shops shown in red, to be followed year by year (Figs. 4 and 5). Each shop is linked to a database offering biographical and residential information about the tenants: their work and titles, their addresses, and their professional and family relationships, all features able to feed into more specific studies of the urban and social mobility of these art-market participants. Georeferencing contacts allowed the extent of their professional relationships to be mapped at the national and international level. The goal is also to make it possible to gain a better understanding of the interplay between neighborhood and social⎯professional and family⎯proximities via the interactions formed between the bridge’s residents. The example of Gilles de Mortain will serve as an illustration. A master painter and a dealer in paintings, drawings, and engravings, he was established on the bridge since 1707, at No. 39, the sign of the “Belle estampe,” four houses away from Gersaint’s. When he died in 1727, his son, Savinien, took over until 1760. Savinien’s widow then continued trading for a few more years until 1763. A sizeable proportion of his business was geared towards publishing and selling views of architecture, maps, and plans, for which he is known to have had professional connections with at least three dealers in Amsterdam: the painter Landsberghs; Paul de La Feuille, an engraver, print dealer, and bookseller; and Jan Duruel, a mirror maker and son of the painter Philippe Duruel. Gilles de Mortain also did business with one Rigault, a dealer in Lyon, who was almost certainly the book dealer and bookseller Claude Rigault (Fig. 6). In 1721, one of De Mortain’s daughters, Catherine, married painter and picture dealer Jacques Pingat, who lived at No. 22, Pont Notre-Dame. Pingat had close business dealings with Gersaint, his effective neighbor. As for Savinien de Mortain, he continued his father’s business dealings with his Dutch contacts. He was also the person who accompanied Gersaint on his first trips to the Low Countries. This simple case study illustrates the value of spatialization as a tool for analyzing spatial dynamics and social networks. If the relational database makes it possible to gather a large amount of heterogeneous data from scattered sources, the interpretation of this data is greatly optimized by visualization. Because it allows one to consider relationships as dynamic processes, which an inert database cannot, visualization facilitates an understanding of the effects of scale, by articulating the “micro” level of the Pont Notre-Dame at national and transnational levels. Fig. 6. Mapping the contacts of Gilles Demortain. Image made by Sophie Raux using the Art Markets Database, 2017. Even so, the heuristic potential of this application and its associated data has to be put into perspective. Under no circumstances should this approach be seen as exhaustive or definitive. While it makes it possible to visualize trends and to advance knowledge of the world of the Pont de Notre-Dame picture dealers, it also has limits because the data from lease contracts are not reliable enough sources to be sufficient in themselves. Cross-referencing against other sources reveals numerous inconsistencies. For example, the lease taken out by Gilles De Mortain in 1707 was contracted to end in 1738 when the party concerned had been dead for more than ten years. Jacques Pingat’s lease began in 1740 but he had lived on the bridge since at least 1725. Jacques Oudry, who founded a long dynasty of painters based on the bridge opposite Gersaint, is reported there from 1713. Yet his signed lease dated only from 1718 and was extended to 1733, whereas he himself died in 1720. Furthermore, the inventory does not feature the presence of painters passing through as apprentices, co-residents, or subtenants who would not have had their own lease contracts. Many of these temporary residents, however, contributed to the dynamics of the Pont Notre-Dame painting market. Finally, it was common practice for the most prosperous painter-dealers to sublet surplus storage space to their neighbors on the bridge and to have other sales outlets elsewhere in Paris. The residential patterns of Ancien Regime Paris created an informal housing economy such that it is difficult to reconstruct these urban micromobilities. Nevertheless, one of the virtues of this visualization is that it highlights a phenomenon that had not been sufficiently acknowledged previously for this particular market: the role of women in the picture trade. As depicted in the Enseigne de Gersaint––in which a woman behind the counter deals with a pair of customers––wives were actively engaged in their husbands’ business ventures. Although the Académie de Saint-Luc was one of the few male corporations in Paris to admit women other than the daughters of its masters, it also took steps to promote family continuity in the profession. Its regulations established that the wives and daughters of masters could achieve master status without serving an apprenticeship. In this way, in 1716, Geneviève Oudry, daughter of the painter Jacques and wife of painter Jacques de Saint-Martin, took over her late husband’s lease at No. 32, a mere stone’s throw from Gersaint’s, using the title “peintresse.” In addition, a widow could continue to enjoy her late husband’s privileges as a master and so too the prerogative of running a shop. A great many wives of master painters and sculptors succeeded their husbands, including the widows of Jacques Ducreux, Jean-Baptiste Ducreux, Edme-François Gersaint, Capraix Gourdon, Pierre Le Sage, Antoine Leclerc, Savinien de Mortain, Antoine Portier, Jean Quantin père, Jean Quantin fils, Robert Quesnel, and Pierre Tremblin. Some had an autonomous status different from that of their husbands. The widow of painter Pierre Pitten, for instance, succeeded her husband for thirty-three years as a “miroitière.” She was not the only woman to demonstrate remarkable longevity: Catherine Oudry and the widow of Jean-Baptiste Ducreux are believed to have followed in their respective husbands’ footsteps for twenty-five years. Whether spouses or widows, these wives of master painters thus had a recognized legal and economic identity under the Ancien Regime. Their presence on the bridge was far from marginal to the extent that indeed, at certain times, as many women as men on the bridge were responsible for renting shops that sold paintings. This was particularly true during the ten years from 1670-1680 and from 1755-1765. In other words, in the case of this microhistorical research, the use of digital tools has made it possible to shed new light on biases in sources and traditional methods, while simultaneously promoting the visibility of actors neglected in the historiography, figures who left little trace in the archives, and women in particular. Due to the overall synchronic view it offers, visualization makes it possible to reveal phenomena that are not perceived so clearly or immediately with traditional methods. The spatial analysis of the entire bridge led us to cross-reference such a great deal of archival data and visual information that it seemed logical to complete our approach with a 3D-rendering of this commercial space. More specifically, we wondered how the display of an art dealer installed on the Pont Notre-Dame might have appeared. Although several options were possible, the restitution of the Gersaint shop was appealing given the celebrity it has achieved as the subject of Watteau’s extraordinary sign. Nevertheless, recontextualizing a shop in its original environment meant restoring the entire bridge. Fig. 7. Louis-Nicolas de Lespinasse, Vue du port au Blé prise à l’extrémité de l’ancien marché aux veaux, regardant le pont Notre-Dame, 1782. Pen and watercolor, 41 x 71 cm (detail). Carnavalet Museum, Paris. Photo: Claudio Gallego. Fig. 8. 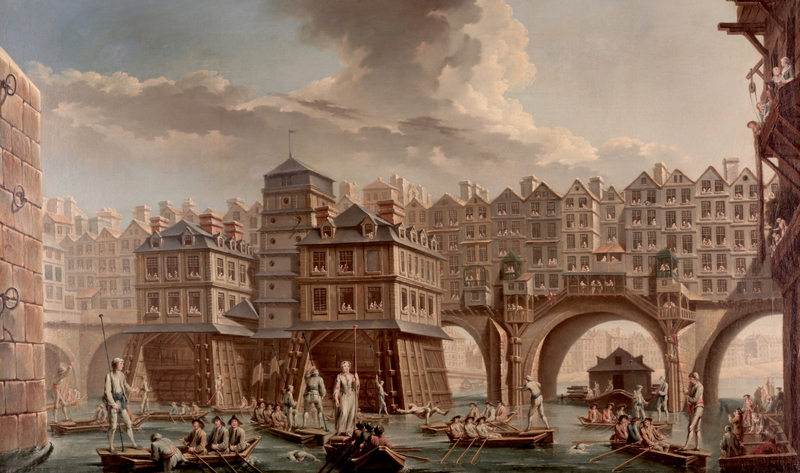 Nicolas Raguenet, La joute des mariniers, entre le pont Notre-Dame et le pont au Change, 1751. Oil on canvas, 47 x 83.5 cm. Carnavalet Museum, Paris. Photo: Claudio Gallego. It is hard to imagine today the effect that this inhabited bridge in the very heart of old Paris must have had. The few available external views impress in terms of the regularity and monumentality of this double row of houses spanning the Seine (facing upstream, Fig. 7; facing downstream, Fig. 8). As for the interior aspect, no visual source is able to provide an accurate topographical view of the site and so the exact commercial character of the bridge and its shops remains an enigma. Hubert Robert painted a noteworthy view of the houses when they were being demolished in 1786 (Fig. 9) but his vision is an interpretation of urban life by an artist who was fascinated by the transformations of a city in the throes of modernization. On no account can his picture of the Pont Notre-Dame, painted from a great distance, be taken as an accurate and reliable document. The bridge’s interior view also inspired several engravers working in the popular register of “perspective views.” The most accurate of these was produced by Pierre Aveline at the end of the seventeenth century (Fig. 10). Like all prints in this genre, the picture was meant to be viewed through an optical device that heightened the impression of depth and the illusion of relief. The prime objective was, therefore, to stimulate curiosity. In addition, the distorted perspective and the lack of rigor regarding the accuracy of details call for caution in viewing it as an iconographic document. Furthermore, we will go on to see the extent to which this deceptive image has misled researchers interested in the morphology of Gersaint’s shop and the placement of its famous Enseigne. These inadequate visual sources led us to attempt to restore the bridge’s inner street by cross-referencing against other data from a great many scattered sources, such as work permits, police regulations, lease contracts, probate inventories, or guides to Paris (Fig. 11). Often vague and difficult to interpret and sometimes even contradicting one another, these data called for patient and rigorous critical research. Fig. 9. Hubert Robert, Démolition des maisons du pont Notre-Dame, 1786. Oil on canvas. 81 x 154 cm. Staatliche Kunsthalle, Karlsruhe. Image source: Creative Commons IMG_5830D. Fig. 10. Pierre Aveline, Vue et perspective du Pont Notre-Dame, end of the 17th century. Etching, 20.8 x 32.2 cm. Carnavalet Museum, Paris. Photo: Claudio Gallego. We paid special attention to house No. 35 on the southern part of the bridge. Edme-François Gersaint moved there in November 1719. He was twenty-five years old at the time, an apprentice mercier, and recently married to Marie-Louise Sirois. Three months later, in February 1720, Gersaint was made a master marchand mercier, a profession specializing in the luxury goods trade. In this capacity, he sold furniture, decorative items (mirrors, chandeliers, caskets, clocks, etc. ), paintings, engravings, and gilded wooden frames. When Watteau painted the famous Enseigne for Gersaint in the fall of 1720, the latter was merely a young marchand mercier, recently established on the Pont Notre-Dame although, before long, he would become the most innovative merchant of his day, a genuine promoter of the modern art trade. As for Watteau, he was already a renowned painter by then, a member of the Academy since 1717, and a dazzling success. Back in France in the summer of 1720 after several months in London, he moved into Gersaint’s house where he lived until the beginning of 1721, when he left to see out his days in Nogent-sur-Marne. He was to die there in July of that year, aged thirty-seven. The friendship that brought the two men together probably stemmed from their close ties to Pierre Sirois, who as Watteau’s first dealer had helped make him fashionable and who was also Gersaint’s father-in-law. Fig. 11. Reconstruction of the inner street of the Pont Notre-Dame. © Chromelight Studio, Roubaix; CREHS, Université d’Artois; LARHRA, Université Lyon 2, CNRS; LISIC, ULCO. 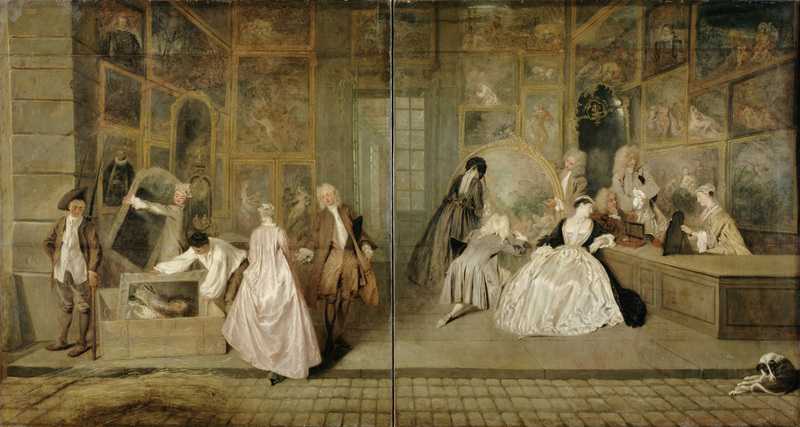 It has been known for more than a century that Watteau’s painting does not in any way accurately depict the interior of the dealer’s shop. As long ago as 1910, Paul Alfassa revealed that the shop’s surface area was barely more than 12 square meters and had little in common with the immense space imagined by Watteau. More recently, Guillaume Glorieux demonstrated that the merchandise Gersaint offered in his shop at the beginning of the 1720s bore no relation to the capacious gallery of pictures painted for the Enseigne: the probate inventory of Gersaint’s possessions, compiled in 1725 on the death of his wife, attests that at that time the shop contained more furniture and decorative items than paintings. 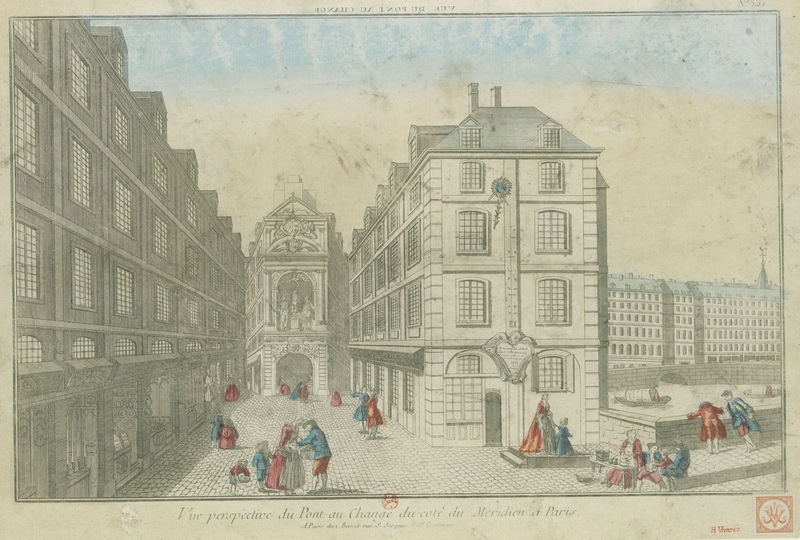 At the end of April 1725, Gersaint’s shop presented passersby on the Pont Notre-Dame with a fireplace, a mirror topped with a painting, four pier-glasses, a small walnut chest of drawers, two screens, an eight-branched bronze chandelier, two corner cabinets, four paintings on canvas in frames, and a wooden sofa covered in “red moquette.” Apart from the sofa, which was part of the shop furnishings, all the other items were for sale, including the fireplace. By also stressing the shop’s narrowness, clutter, and darkness, Glorieux conclusively demonstrated that Gersaint’s shop—that is, a sales outlet opening onto the street—bore no resemblance to Watteau’s Enseigne. Even with this knowledge, the scale of the disconnect is still difficult to appreciate. Comparing the contents of an image with its referent when the latter has physically disappeared is a methodological challenge that art historians face on a regular basis. 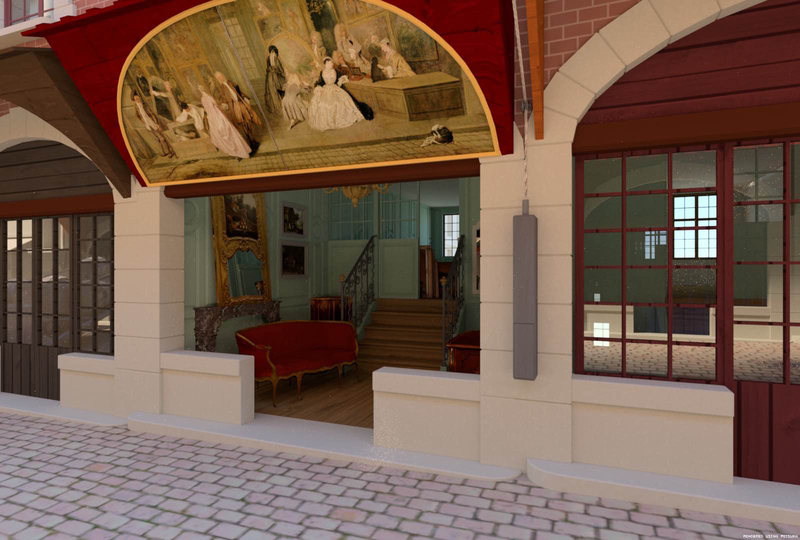 In order to achieve a better assessment of the disparity, we opted for a digital reconstruction of Gersaint’s shop. The first stage was to model the whole of the residence. Among the various sources brought to bear, two cross-section views of the houses on the bridge proved crucial for producing a robust 3D digital model (Figs. 12 and 13). One view, its origins just established by Nicolas Moucheront, was produced by Pierre-Louis Moreau, architect of the city of Paris, at the request of Pierre-Jean Mariette whose primary requirement was accuracy. Indeed, the first cross-section gives the exact scale of elevation for each of the five levels, together with the positioning of the stairs between the floors. The second provides information on the position of the fireplaces and their flues and specifies the position of the awnings, a detail of particular importance for our purposes. Since all the houses on the bridge were built to a similar model, we used inductive reasoning and applied the features revealed for other houses to Gersaint’s home. Fig. 12. M. Decossan, Coupe de l’arche marinière du pont Notre-Dame, 1747. Pen drawing enhanced with watercolor. École nationale des Ponts et Chaussées, Marne-la-Vallée, ms 2235. Photo: ENPC. Fig. 13. Pierre-Louis Moreau, Coupe du pont Notre-Dame, 1771-1772. Pen drawing enhanced with watercolor in Domenico Maria Federici, Il Convito Borgiano (1792, Ms 164, vol. II. ), Biblioteca di Treviso, Treviso. Photo: Luigi Baldini. In the next stage, we set about recreating a plausible interior of Gersaint’s shop at the time when it displayed the Enseigne. The interior layout and the type of goods on sale were inspired by the information in the probate inventory of 1725. Although the document recorded Gersaint’s possessions at the time of writing, in other words nearly four and a half years after the time with which we are concerned, it may be assumed that there were no fundamental differences in the general image the shop presented to the street: no large counter, a few paintings, and a significant number of small pieces of furniture. A partnership with the Musée Carnavalet made it possible to scan objects and decorative items in its collections that are equivalent to those described in the inventory—a chest of drawers, a fireplace, a corner cabinet, wooden wall paneling, stair rails, gilded and silvered frames, a sofa—and these were then placed in the virtual shop. While a good many details in this reproduction remain conjectural, the overall outcome has a sufficient degree of plausibility to make sense; the gap between the idealized vision of the spacious art gallery painted by Watteau and the much more likely reality of a modest shop on the Pont Notre-Dame has been made tangible (Fig. 14). How, though, should it be interpreted? For the investigation to be complete, the key issue of the Enseigne’s location on Gersaint’s shopfront must be tackled. To date it has never been truly settled. Fig. 14. Reconstruction of Gersaint’s shop. © Chromelight Studio, Roubaix; CREHS, Université d’Artois; LARHRA, Université Lyon 2, CNRS; LISIC, ULCO. This Piece, which is 9 feet 6 inches wide by 5 feet tall, has always been regarded as the Masterpiece of this excellent Painter. It represents the Shop of a Dealer, which is full of various Paintings by the greatest masters (…). This famous Sign was on display for only two weeks; it was admired by the whole of Paris. The hypotheses put forward in recent years regarding the placement of this painting remain problematic. They are based on analyzing the physical traces visible on the surface paint layer, which include marks from how it was hung and the various forms in which it appeared. In 1964, Hélène Adhémar estimated that the large trace of a curve, visible across the entire width of the painting, suggested that the Enseigne was originally curved rather than rectangular and some 50 centimeters wider than at present (for a total width of nearly 3.55 meters). She claimed that between 1720 and 1732 the original format was changed, increasing the height and reducing the width to produce a rectangle corresponding to the current dimensions. After its narrowing, the Enseigne would have been more in keeping with the dimensions of a cabinet painting, which was what it had effectively become. Guillaume Glorieux subscribed to this hypothesis and concluded that the curved painting, wider and not as tall as it is today, must have been placed in an upright position beneath the arch of Gersaint’s shop. It would have been positioned above the awning that Glorieux, based upon the example of Aveline’s engraving, placed beneath the arch, at the level of the transom. In 2007, a more in-depth study of the picture’s materiality enabled Christoph Vogtherr and Eva Wenders de Calisse to dispense with all previous hypotheses. They demonstrated that the painting had always been rectangular, not curved, and more than 20 centimeters wider than Adhémar’s estimate. Yet, a rectangular sign, 3.75 meters wide, would no longer fit into a curved space of 3.56 meters. They deduced, therefore, that the Enseigne had been displayed behind––and not under––the arch, looking out from the shop, which allowed for the greater width. The arch’s blind spandrels would have hidden the upper corners of the rectangular painting. In addition, they believed the semicircular mark on the surface of the painting layer, from which minuscule traces of gold leaf had been lifted, was left by the frame that was needed to display the Enseigne. The awkward issue of the position of the awning⎯still beneath the arch⎯was not raised. Fig. 15. Digital simulation of the proposal made by Guillaume Glorieux (2002). © Chromelight Studio, Roubaix; CREHS, Université d’Artois; LARHRA, Université Lyon 2, CNRS; LISIC, ULCO. Fig. 16. Digital simulation of the proposal made by Christoph Vogtherr and Eva Wenders de Calisse (2007). © Chromelight Studio, Roubaix; CREHS, Université d’Artois; LARHRA, Université Lyon 2, CNRS; LISIC, ULCO. Our 3D model of Gersaint’s house made it possible to put the different proposals to the test (Figs. 15 and 16). Our simulations highlighted two inconsistences. The first related to the dimensions of the Enseigne, which were unsuited to the height of the shopfront. In an upright position, it came too far down. The second concerned the position of the awning and whether it was under the sign (Glorieux) or under the arch (Vogtherr and de Calisse). This presented a two-fold problem. Firstly, hanging the sign above rather than below the awning did not conform to the practices of the day. Secondly, this arrangement undoubtedly hampered the sign’s visibility, which would have been paradoxical for an image designed to catch the eye. The mistake stems from Aveline’s imagined view in which the awnings appear at transom level, as if the houses on the Pont Notre-Dame had a half-story, which was never, in fact, the case (Fig. 10). The awnings were attached higher up, above the arch of each shop rather than at transom level. By contrast, the shops on the nearby Pont-au-Change did have a mezzanine floor, to which their awnings were attached, a principle shamelessly followed by Aveline (Fig. 17). Fig. 17. 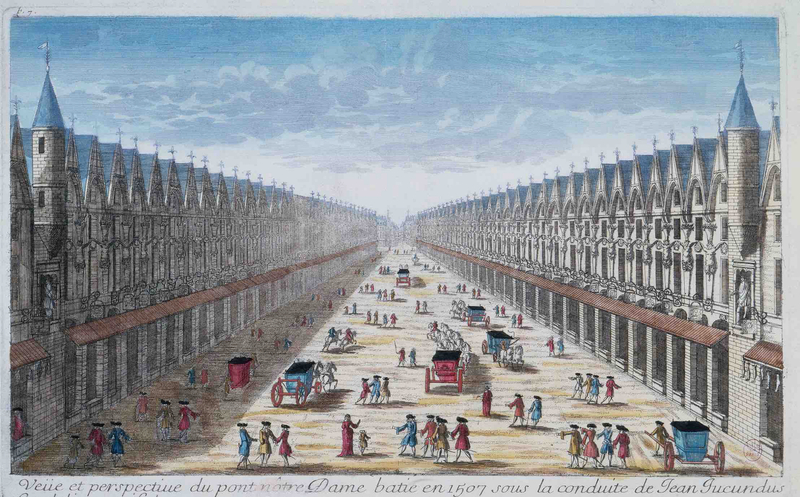 Anonymous, Vue perspective du Pont au Change du coté du Méridien à Paris, 1750. Etching, colored, 29 x 43 cm. Department of Prints and Photographs, National Library of France, Paris. Image in the public domain. However, moving the awnings to the proper position⎯above the arches⎯still does not resolve the basic problem of visibility: the upper part of the shopfronts was necessarily obscured by the shadow of the awnings, making them less suitable for accommodating a sign (Fig. 18). Our approach led us to support a proposal that Youri Carbonnier developed as our collective thinking progressed: as attested in several documents of the time, including the view of the Pont-au-Change (Fig. 17), it was not unusual for “plafond” shop signs to be placed beneath the awnings in an inclined rather than an upright position. Furthermore, most of the shop awnings on the Pont Notre-Dame were curved, that is to say, fitted underneath with a wooden arrangement that formed an arch more or less matching that of the shop. An inventory of Gersaint’s house in 1735 attests that the shop was adorned by a curved awning of this kind. We concluded, therefore, that the Enseigne de Gersaint was displayed beneath the awning in an inclined position (Fig. 19). All the data already revealed reinforce this hypothesis, including the original dimensions of the painting estimated by Vogtherr and de Calisse; the visible traces on the painting layer; the cross-section by Pierre-Louis Moreau (Fig. 13); and the definition of a “plafond” shop sign. Fig. 18. Reconstruction of the interior view of the Pont Notre-Dame © Chromelight Studio, Roubaix; CREHS, Université d’Artois; LARHRA, Université Lyon 2, CNRS; LISIC, ULCO. It was decided that, upon pain of exclusion, all members of the academic body would refrain from having an open shop in which to display their works, from exhibiting them in the windows or other external parts of their residence, and from attaching to the latter any sign or inscription stating that they were on sale, and would do nothing that might confuse the honorable status of academicians with the mechanical and mercenary status of the masters of the community. This notion of commercial disinterest was inseparable from the recognition of the nobility of painting and its accession to the ranks of the liberal arts, for “there is nothing but nobility in painting when it is practiced without trade,” as Gilles-André de La Roque stated in his Traité de la noblesse (1678). As for the shop sign as a genre, it had been the most denigrated in the art world since ancient times. Even Pliny had classified it as rhyparography. In eighteenth-century Paris, some 2,000 shop signs were painted a year, bread-and-butter work that was the preserve of mediocre and obscure painters from the Guild. This huge sign, promoting an idealized image of the art trade and painted by one of the most prominent painters of the Academy, was ostentatiously displayed over a dealer’s shopfront in one of the busiest streets in Paris, one of the locations most reviled by Academy circles precisely because of its concentration of art dealers’ shops. In treating the shop sign genre with the same sophistication as his fêtes galantes and in enhancing the image of the art trade in an unprecedented manner, Watteau was blurring the lines between popular and elite culture, between minor and major art. He was also offering an impressive display of his contempt for the social and artistic hierarchies that were core principles of the Academy to which he belonged. In this sense, the public display of the Enseigne must also be understood as a political gesture. Through this painting, Watteau was also stating the ambitions of Gersaint, who would soon establish a new image of the art dealer as a connoisseur and an expert. This image was given greater value at the social level, even if it was to remain in open conflict with the figure of the disinterested amateur, supported by Academy circles. Gersaint would subsequently turn out to be a champion of building a self-image through different media: shop signs, address cards, and advertisements in the press. Taken as a whole, these initiatives helped create a public sphere surrounding the art worlds that had already been brilliantly imagined in their nascent stages by the Enseigne. Acknowledgements: I am grateful to Melanie Moore for her English translation. 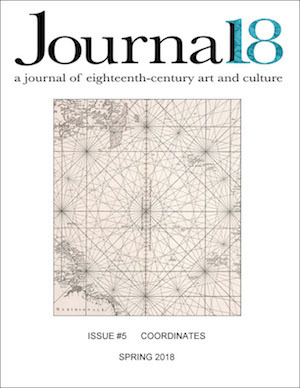 I also owe my thanks to the editors of Journal18 as well as the anonymous reviewers for their helpful comments and remarks. My thanks go also to Sarah Grandin for her help with the latest modifications in English. Julie Anne-Plax, Watteau and the Cultural Politics of Eighteenth-Century France (Cambridge: Cambridge University Press, 2000); Guillaume Glorieux, A l’Enseigne de Gersaint. Edme-François Gersaint, marchand d’art sur le pont Notre-Dame (1694-1750) (Seyssel: Champ Vallon, 2002); Guillaume Glorieux, “Les peintres-marchands du pont Notre-Dame: une production organisée de tableaux ‘flamands’ pour Lille et sa région,” in Sophie Raux, ed., Collectionner dans les Flandres et la France du Nord au XVIIIe siècle (Villeneuve d’Ascq: Université Lille 3, 2005), 139-145; Christoph Martin Vogtherr and Eva Wenders de Calisse, “Watteau’s ‘Shopsign’: the Long Creation of a Masterpiece,” The Burlington Magazine 149:1250 (2007), 296-304; Christian Michel, Le “célèbre” Watteau (Geneva: Droz, 2008); Mickaël Szanto, “The Pont Notre-Dame, Heart of the Picture Trade in France (16th-18th Centuries),” in Neil De Marchi and Sophie Raux, eds., Moving Pictures. Intra-European Trade in Images, 16th-18th Centuries (Turnhout: Brepols, 2014), 77-91. Since 2012, the program has been supported consecutively by the Agence Nationale de la Recherche, the Fonds Expériences Interactives de la région Nord Pas-de-Calais, the Visual and Cultural Sciences center (Université Lille 3, Lille 1 and CNRS), and the National Center for Scientific Research. We welcomed the assistance of researchers in urban history: Youri Carbonnier (CREHS, Université d’Artois), Sophie Reculin (IRHiS, Université Lille 3); art history: Laura Louvrier (IRHiS, Université Lille 3); computational sciences: Christophe Renaud, François Rousselle, Frédéric Foveau (LISIC, Université du Littoral et de la Côte d’Opale); musicology: Mylène Pardoen (ISH, Lyon). Also involved were experts in 3D computer graphics: Claudio Gallego and Prosper Groux (Chromelight Studio, Roubaix), and sound processing: Quentin George (Aspic Technologies, Tourcoing). visualization and virtual reality, offering flexible interoperability. For the tablet app and for a 4K screen display, Unreal Engine 4 was used. This game engine, made for photoreal rendering in real time, is well suited for interactive architectural visualization. It enables us to know what the finished model will look like at every step of the work, while allowing us to see and save updates as changes are made to source content. Using the categories of master painter and mercier makes it possible to single out the most prominent picture dealers on the bridge. The category of print dealer was not used in this phase of the study. This database will be available online by summer 2018 at www.artmarkets.eu. Glorieux, A L’enseigne de Gersaint, 303-305, 344. Some major names in painting began their careers with the bridge’s painter-dealers. They include Claude Vignon, Antoine Watteau, Joseph-Marie Vien, Louis-Jacques Durameau, Jean-Baptiste Greuze, Martin Drolling, Jean-Joseph Xavier Bidauld, and Julien de Parme. See Szanto, “The Pont Notre-Dame,” 80. Jules Guiffrey, “Histoire de l’Académie de Saint-Luc,” Archives de l’art français (1915), 25; Antoine Schnapper, Le métier de peintre au Grand Siècle (Paris: Gallimard, 2004), 83-87. Cynthia Truant, “La maîtrise d’une identité? Corporations féminines à Paris aux XVIIIe et XIXe siècles,” Clio 3 (1996), 55-69; Séverine Sofio, Artistes femmes. La parenthèse enchantée XVIIIe-XIXe siècles (Paris: CNRS éditions, 2016), 28-36. The post-death inventories of several art dealers settled on the Pont Notre-Dame provide information about their stock. For instance, for Jean Quentin in 1651 or Pierre de La Scelle in 1654, see Georges Wildenstein, Le goût pour la peinture dans la bourgeoisie parisienne au début du règne de Louis XIII, d’après des inventaires après decès et des contrats de mariage conservés au minutier central des notaires aux archives nationales (Paris: Gazette des Beaux-Arts, 1959), 96, 99. For Etienne Desrais’ stock, see Guillaume Glorieux, “Les débuts de Watteau à Paris: le pont Notre-Dame en 1702,” Gazette des Beaux-Arts 1597 (2002), 251-262; for Gilles Demortain, in 1727, see Mireille Rambaud, Documents du Minutier central concernant l’histoire de l’art (1700-1750) (Paris: Archives nationales, 1964), 556. Three versions with slight variations exist: Paris, Musée du Louvre, Paris, Musée Carnavalet, Karlsruhe, Staatliche Kunsthalle. Glorieux, A l’Enseigne de Gersaint. Guillaume Glorieux, “Pierre Sirois (1665-1726): le premier marchand de Watteau,” in Jeremy Warren and Adriana Turpin, eds., Auctions, Agents and Dealers. The Mechanisms of the Art Market 1660-1830 (London: The Wallace Collection, 2007), 87-102. Paul Alfassa, L’Enseigne de Gersaint (Paris: Jean Schemit, 1910). The measurements Alfassa provides for the shop are 3.56 meters wide between the shopfront’s two pillars and 3.40 meters deep. Glorieux, A l’Enseigne de Gersaint, 507-517. Nicolas Moucheront, “L’histoire du pont Notre-Dame vue au XVIIIe siècle par l’architecte Pierre-Louis Moreau,” in Youri Carbonnier, Sophie Raux, and Christophe Renaud, eds., Watteau, Gersaint et le pont Notre-Dame (Villeneuve d’Ascq: Presses Universitaires du Septentrion, 2018, forthcoming). The museum’s collections do not contain a sofa from the Regency era, so a sofa from the later Louis XV period was used instead. “Ce Morceau qui a 9 pieds 6 pouces de large, sur 5 pieds de haut, a toujours été regardé comme le Chef d’œuvre de cet excellent Peintre. Il représente le Magazin d’un Marchand, qui est rempli de différens Tableaux des plus grands maîtres (…). Cette fameuse Enseigne ne fut exposée que quinze jours; elle fit l’admiration de tout Paris.” Mercure de France (November 1732), 1244. “On sait la réussite qu’eut ce morceau (…) il attiroit les yeux de tous les passants; et même les plus habiles peintres vinrent plusieurs fois pour l’admirer.” Edme-François Gersaint, Catalogue raisonné des diverses curiosités du cabinet de feu M. Quentin de Lorangère (Paris: J. Barois, 1744), 183-184. Hélène Adhémar, “L’Enseigne de Gersaint par Antoine Watteau. Aperçus nouveaux,” Bulletin du Laboratoire du Musée du Louvre 9 (1964), 7-18. Glorieux, A l’Enseigne de Gersaint, 87. Vogtherr and Wenders de Calisse, “Watteau’s ‘Shopsign’,” 298. Their argument was subsequently developed in Französische Gemälde. I, Watteau, Pater, Lancret, Lajoüe (Berlin: Akademie Verlag, 2011), 183-193. Cf. Youri Carbonnier, “Les maisons des ponts parisiens à la fin du XVIIIe siècle: étude d’un phénomène architectural et urbain particulier,” Histoire, Economie et Société 4 (1998), 711-723. Carbonnier, “Les maisons des ponts parisiens,” 715. Cf. Paris, Archives Nationales, Q/1/1255/3. Andrew McClellan, “Watteau’s Dealer: Gersaint and the Marketing of Art in Eighteenth-Century Paris,” The Art Bulletin, 78:3 (1996), 239-453. Thomas Crow, Painters and Public Life in Eighteenth-Century Paris (New Haven: Yale University Press, 1985). “Il fut décidé que tout membre du corps académique, sous peine d’en être exclu, s’abstiendroit de tenir boutique ouverte pour y étaler ses ouvrages, de les exposer aux fenêtres ou autres endroits extérieurs du lieu de sa demeure, ou d’y apposer aucune enseigne ni inscription pour en indiquer la vente, et de ne rien faire enfin qui pût donner lieu à confondre l’état honorable d’académiciens avec l’état mécanique et mercenaire des maîtres de la communauté.” Anatole de Montaiglon, Mémoires pour servir à l’histoire de l’Académie royale de peinture et de sculpture depuis 1648 jusqu’en 1664 (Paris: P. Jannet, 1853), I:62. Gilles-André de La Roque, Traité de la noblesse, de ses différentes espèces (Paris: E. Michallet, 1678), 469. Plax, Watteau and the Cultural Politics, 154-182. The concept of the public sphere should be understood here as sketched by Jürgen Habermas in The Structural Transformation of the Public Sphere: An Inquiry into a Category of Bourgeois Society, trans. T. Burger with the assistance of F. Lawrence (1962; Cambridge: Polity, 1989). That of “art worlds” refers to Howard Becker, Art Worlds (Berkeley: University of California Press, 1982). For an excellent methodological reflection on the potential and limitations of such historical digital reconstruction, see Diane Favro and Christopher Johanson, “Death in Motion: Funeral Processions in the Roman Forum,” Journal of the Society of Architectural Historians 69:1 (2010), 12-37, http://jsah.ucpress.edu/content/69/1/12 (accessed March 2018); Catherine Roach, “Rehanging Reynolds at the British Institution: Methods for Reconstructing Ephemeral Displays,” British Art Studies 4 (2016), http://www.britishartstudies.ac.uk/issues/issue-index/issue-4/rehanging-reynolds (accessed March 2018). Hans Robert Jauss, Towards an Aesthetic of Reception (Brighton: Harvester Press, 1982), 70.